Turn the George Foreman on before placing the bacon on the grill. 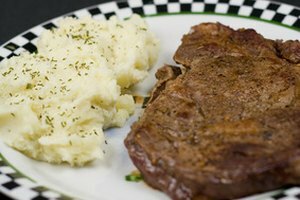 Place the fat-catching dish beneath the Foreman grill and place the slices of bacon on the heated grill. Close the grill and allow the bacon to cook for three or four minutes, depending on how rare or crispy you like your bacon. 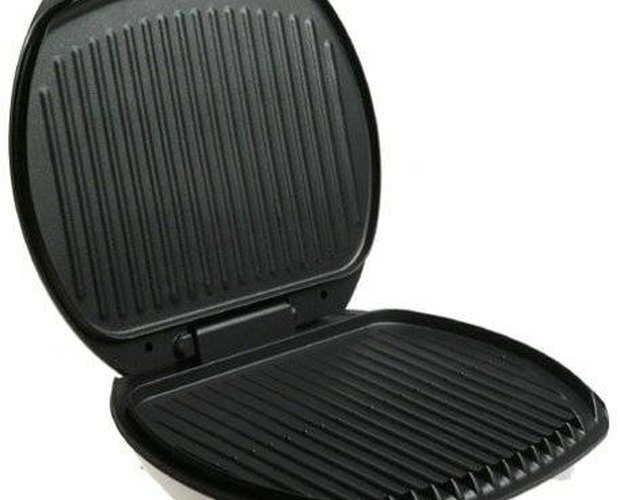 Open the grill and flip the bacon slices over. To prevent the hot bacon fat from popping on your skin once you open the grill, wear an oven mitt or long-sleeve shirt. Cook the bacon for another two or three minutes and serve. Though you can blot the bacon if you like, the fat catcher will remove most of the bacon fat for you. 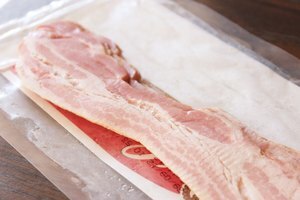 An easy way to tell whether your bacon is fully cooked or not is to monitor the juices that fall into the fat catcher. As the bacon cooks, the juices will be white, thick or foggy in appearance. Once the bacon is fully cooked, however, the juices will appear thinner, lighter and clearer in color. You can always lift the lid of the Foreman to check on the bacon's color. 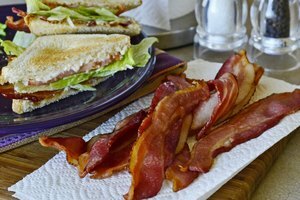 Crispy bacon is darker in appearance than rare bacon, and its texture is firmer. Not only will the Foreman grill allow you to remove a lot of the unhealthy fat from bacon, but it will also allow you to cook the bacon evenly every time. 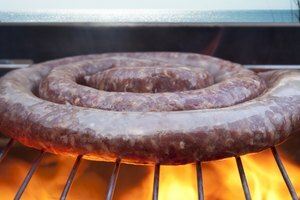 Since bacon is a thin meat and the lid of the Foreman sits right on top of it, the slices receive an even distribution of heat. Another problem that those who cook bacon on the stove experience is the curling up of the bacon slices. 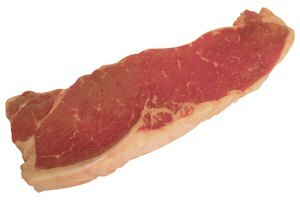 This happens when the ends of the slices receive more heat than the mid-section, causing the ends to curl up. Because the Foreman's lid keeps the bacon slices in place, the ends are not able to curl up, resulting in perfectly cooked, long slices of bacon every time.